The Kumulos App Store Optimization feature make it easy to win more clients, nail app store listings first time and get more of your mobile app projects on retainer. With more than 60% of apps being downloaded following in store searches, offering an ASO service that drives downloads for your customers apps is a true Win/Win for you and your clients. Kumulos helps app development businesses win more clients. In seconds you can see how any app performs in the Apple App Store and Google Play Store. Benchmark apps built by the competition, send them a Kumulos generated report and show prospects how you’d optimize their app store presence to generate more downloads. A great way to get your foot in the door, so you’re in the perfect position to win future mobile app development projects. Pulling the trigger and going live before your client has clearly thought through their app store presence is a sure-fire way of having a flop on their hands. But that’s where you come in and Kumulos can help you. We take the guesswork out of the app store launch and put science behind getting it right, first time. We show you how the competition rank against a range of search terms in the geographies your launching in. We’ll also show how competitive these keywords are, the volume of searches they generate and how the competition is optimizing their app store listing for them. This lets you be smart about how you position your clients app so they compete successfully and win more downloads. Keeping your client’s app store listing in good shape is an ongoing job. It’s also a service that clients will happily pay monthly for. The app you worked so hard on launching will start slipping down the app store rankings unless your continually optimize its app store presence. Kumulos is here to help you keep your clients app on top. 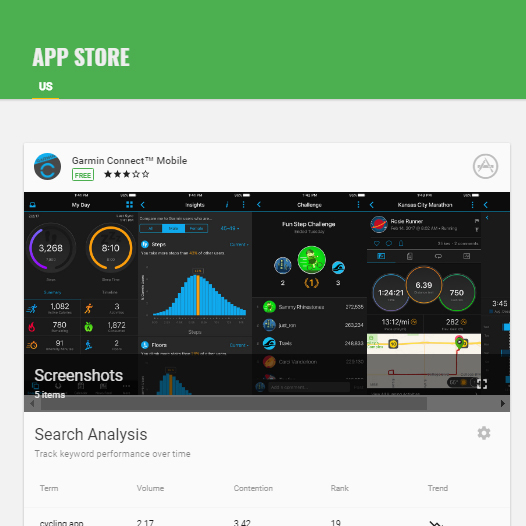 We let you easily deliver insights into how the app is performing. The Client Portal lets your clients log in whenever they want to see how their app is performing in the app store. We also give you an easy to use weekly or monthly report, branded as yours, so you can show your clients how your App Store Optimization efforts are paying off. Whats more we don’t even need your app store credentials. Kumulos ASO will cost you just a few pennies a day for each app. So, there’s plenty of scope to bundle us into your monthly App Store Optimization Service, make your life easier and still offer it at a price your customer will be happy to pay. A monthly recurring revenue service that helps makes their app a success and builds recurring revenue for your business. You make money monthly and look awesome in front of your clients. Let Kumulos help you optimize your Client’s app store performance, and get them on a monthly retainer.